Featuring a cute little baby monkey in a crib in it's nursery in shades of brown, green, and beige/tan. The balloons display the baby's name. Coordinates with any jungle/safari monkey baby nursery theme. 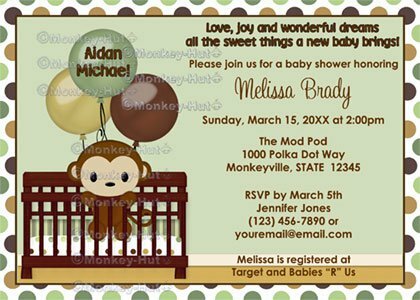 This MonkeyHutDesigns baby shower invitation coordinates with many of today's popular baby crib bedding set(s), such as the Mod Pod Pop Monkey set. This invitation is also great for a boy or a girl (neutral colors).